Recent release “Laura's List” from Page Publishing author Michael McCord is a riveting narrative of making the most of every moment with her family, friends and co-workers when breast cancer returns with a vengeance. Michael McCord, who wrote for two daily newspapers during high school, college, and law school before taking 40 years off to practice law, has completed his new book “Laura's List”: a captivating account of his wife’s life with breast cancer. Laura has it all when breast cancer returns with a brain tumor, and cancer of the meningeal lining. You’ll laugh and cry with Laura’s family members as they deal with life’s trials and triumphs learning that sometimes the victory is making the most of every day. Author McCord speaks through Laura’s friends and family as they view their friend, co-worker, daughter, sister, wife, mother, and grandmother, and make peace with the new reality--sometimes life must be lived not in years, but in moments. 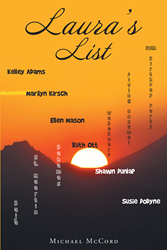 Published by New York City-based Page Publishing, Michael McCord’s Laura’s List follows a strong and determined woman after her day, and life, are brought to a sudden halt when seizures literally drop her to the floor. Readers who wish to experience this moving work can purchase “Laura's List” at bookstores everywhere, or online at the Apple iTunes store, Amazon, Google Play, Kobo, or Barnes and Noble.